I like to bend the rules when it comes to Mediterranean cooking. First with my “not hummus” garlic garbanzo bean purée, now with this highly flexible chickpea and olive tabbouleh. It’s a far cry from the overly herby takeout tabbouleh I’ve eaten, which is exactly why I love it. Instead of being dominated by herbs, I decided to invite some big, briny, salty olive flavor to the party. The key is adding enough olives to make it noticeably “olive tabbouleh”, but not so many that you feel like you’re eating an olive salad with a side of grains. Another liberty I take with classic tabbouleh here is really packing in the nutrients by replacing some of the chopped herbs with very finely chopped kale. Every time I eat tabbouleh from a restaurant, I feel super self-conscious, like the world might end if I don’t find some dental floss ASAP. Chopped kale isn’t quite as tender as herbs are, and, as a result, it doesn’t end up stuck between your two front teeth as easily, making any post-lunch social engagements far less awkward. The final piece in this pseudo-tabbouleh puzzle is my favorite protein-packed chickpea. Well, not just one chickpea–ha. A whole can! Since I’m eating mostly meatless these days, I look for any way that I can to sneak beans, lentils, or maybe even some tofu into dishes that might traditionally be considered sides. Adding a can of chickpeas to this salad easily renders it a one-dish lunch that couldn’t be easier to transport to the office, in the car while you run errands, or on a road trip. You can keep it in the fridge or at room temp* and eat it chilled, warmed, or also room temperature. You might notice that the grain in the pictures doesn’t resemble the bulgur of traditional tabbouleh–that’s because it isn’t. On the day I made this olive and chickpea tabbouleh to photograph (I might have also snuck in a few bites), I didn’t have any bulgur on hand. 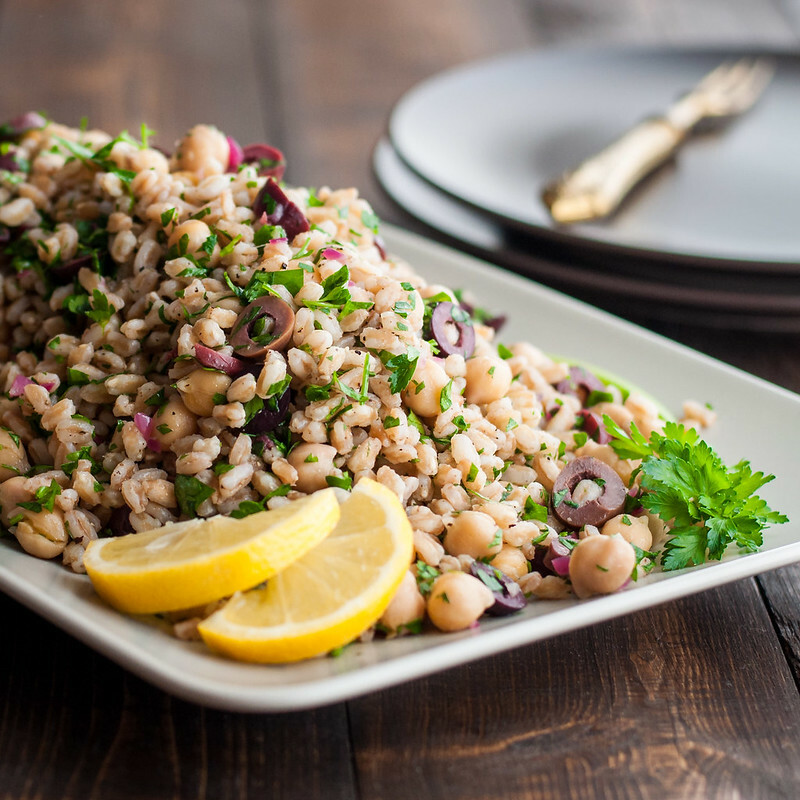 Instead of frantically running down the street to buy some, I decided to showcase the flexibility of this particular olive tabbouleh, and grain salads in general, by substituting the pack of farro I did have in the pantry. It cooked even faster than bulgur (mine was the 10 minute variety from Trader Joe’s) and I love the more toothsome texture. In the end, it turns out that my chickpea and olive tabbouleh is what some would call a far cry from the traditional recipe. However, I stand by it. 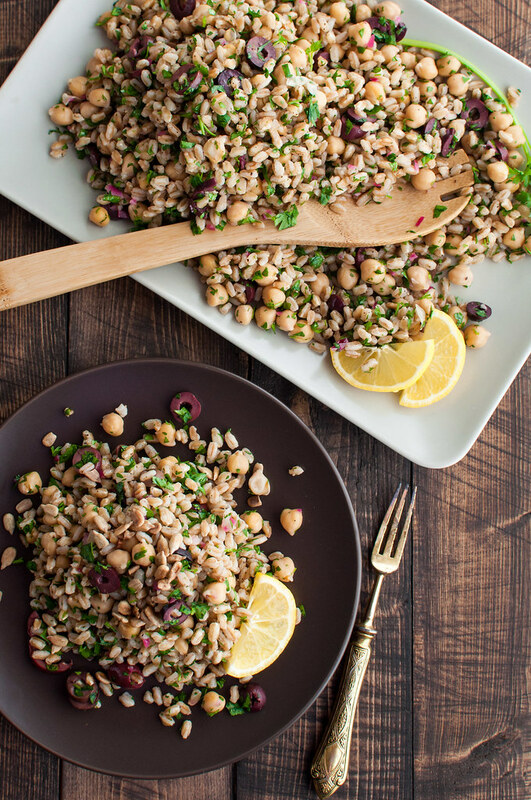 One, because it’s delicious, but two, it’s built on the principles of tabbouleh–the big ones being a grain and lots of leaves.Whatever you want to call this healthy, flavorful grain salad, I hope you give it a try. Here in the U.S., it’s almost Independence Day. I can’t think of a better occasion for such a portable, make-ahead friendly olive tabbouleh recipe. Unless you’re part of a super aware group of friends, you’ll probably agree that healthy, vegetarian options are rare at holiday picnics. Why not be the one to rock the boat and bring something both good and good for you, to sound totally cliché. When I head up to Portland, Maine this weekend, I plan on indulging in plenty of doughnuts and maybe even a lobster roll, but I’m going to balance that out by throwing together simple homemade trail mix and a few more of my favorite healthy travel snacks. We’re also eating relatively light and most definitely meatless at home this week. At dinner tonight, I was thinking just how scary our plates would have looked to me ten years ago: a bed of quinoa beneath a pile of bright purple braised cabbage (from this week’s CSA share), accompanied by curried lentil salad. No meat, no bread, and yet this is the kind of thing I love to eat now. When I feel guilty about taking a tiny third helping of creamy vegan curried lentil salad, I think I just need to remind myself of my days of summer sausage sandwiches on Wonderbread as a pre-workout snack. And guess what. Not a bit of that change happened overnight. If you’re trying to make healthy choices but are worried about the Fourth, don’t be! Go prepared with something healthy to share, but also, dig in, in moderation. What’s the point of spending the whole day tortured by things you can’t have, when it’s supposed to be a celebration? To keep tabs on what I’m eating in Maine and who I’m cuddling with during fireworks (the suspense! ), follow me on Insta and, more recently, Twitter! I can’t promise regular tweets, but if that’s your choice of social media, you can now use it to stay on top of my Insta and find out about new blog posts and recipes. And of course, if you make any Natural Comfort Kitchen recipes for the 4th, tag them #nckhomemade! * Don’t leave raw garlic at room temperature for extended periods when mixed with oil. I prefer to err on the side of caution, bringing the salad to room temp only an hour before I plan to consume it. Perhaps we should call this "faux tabbouleh". It might not strike you as the herby Greek restaurant version, but it's built on the same principle of grains and greens, with added plant protein and big, briny olive flavor. Combine lemon juice, red onion, ½ teaspoon salt, and garlic clove in a large mixing bowl. Set aside. Cook bulgur or farro according to package instructions (see notes for no-cook bulgur method). Just before grains are done, remove garlic from lemon juice and whisk in olive oil. Season with pepper to taste. Add cooked, hot grains to bowl of dressing and stir to combine. Add greens/herbs, olives, and chickpeas and stir to combine. Taste for salt and season as needed. Serve at any temperature, alone or over salad greens. If desired, top with crumbled feta (if not vegan) and nuts or seeds. No-cook bulgur: combine dry bulgur with almost twice as much boiling water in a mixing bowl. Stir once, then set aside for 30 minutes as bulgur absorbs the water and "cooks". Taste for tenderness--it should be easy to chew, then drain through a fine mesh strainer if excess water remains. Besides adding ½ teaspoon salt to dressing, don't salt the tabbouleh until after adding olives, as they contribute a lot of flavor. As written (sans cheese) the recipe is vegan. The salad will last several days in the fridge. Before serving, taste for more lemon juice, olive oil, or additional salt and pepper and adjust as needed. Note: This page contains affiliate links. It does NOT contain sponsored content. Affiliate links (to products I recommend, on Amazon) offset my ingredient and website maintenance costs, so I can keep bringing you irreverent recipes like this one. Thanks! I’m a BIG fan of all things mdretieranean/middle eastern and especially tabbouleh! Subbing in quinoa is an awesome idea healthier and super delicious.Joanne recently posted..